What a wonderful Father's Day. 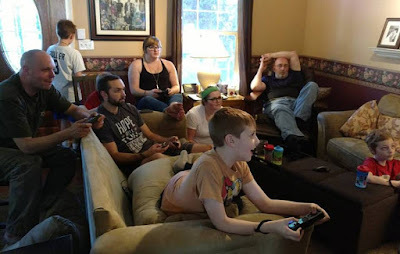 We spent the early part of the afternoon playing video games with my side of the family. An homage to the days of my childhood. The end of the day was spent with my husbands family. BBQ, and good times. I'm grateful for all the fathers in my life. For my own husband who is raising my three sons to be great fathers of their own. For my father who taught me to persevere through the hard times. To my father-in-law who has taught me to always show strength, even when you don't feel strong on the inside. Enjoy this weeks menu and the first week of summer!